My parents and brother came to ABQ for my 30th birthday. We took a bike ride out to see the balloon fiesta and did some other small trips around town. I was spending a lot of time trying to figure out all the "clues" - my Mom asked a bunch of my friends to send me riddles and puzzles to unlock a code. Here's the full synopses. My party was reasonably well attended and I got to see a few friends I hadn't seen in years. There was a huge cake, a bonfire, dancing, and New Mexican food. 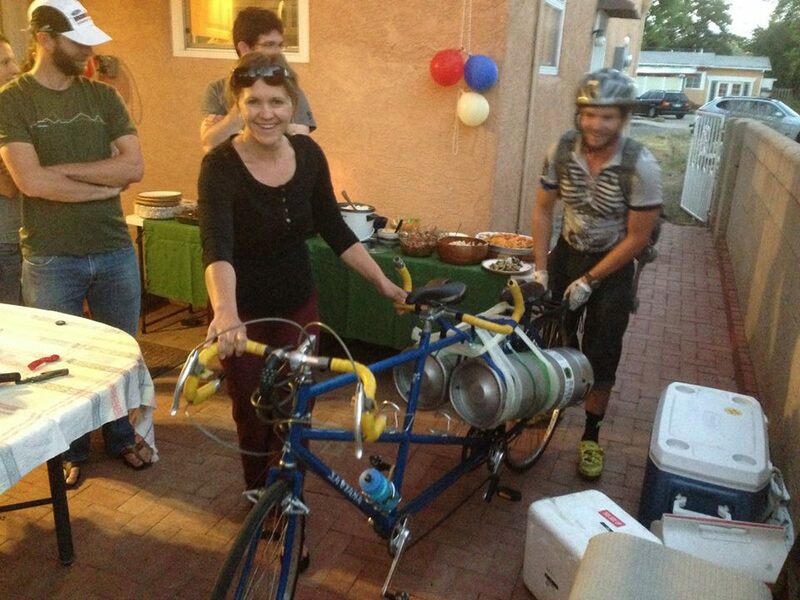 The beer came via tandem bicycle, which made it taste that much better! 1. Ski Mt. Rainier. Half credit since the intent was to ski off the summit. Mike and I turned back at Ingraham Flats when the avalanche danger seemed too high. 2. Scuba dive a tropical reef. Full credit for doing a great drift dive in St. Vincent and the Grenadines. 3. Eat an amazing steak in Argentina. Full credit for the great ribeye in Mendoza. 4. Buy fat skis, shred pow, and huck a 10+ footer. Full credit. Got Volkl Katanas, played in powder, and dropped the Chair 4 cliff on a hardpack day. 5. Bike 3,000 miles with 50,000 ft of elevation gain. Half credit for logging 2648.3 mi and 116,531 ft on Strava. Not bad for an average of 50.9 mi/week! 6. Climb South Maroon Peak via the Bell Cord. No credit. 7. Mountain bike 20 miles at night. Full credit with Josiah, Briana, Mike, Allison, and Sam out at White Mesa. 8. Climb a high alpine route to a major summit (e.g., Ellingwood Ledges). No credit. 9. Take a train from Oslo to the Norwegian fjords. No credit. 10. Become a technician on Albuquerque Mountain Rescue. No credit. 11. Spend a week at burning man. No credit. Did get the option to buy tickets, but was double booked with a work trip. Next year! 12. Go hot air ballooning. Full credit for a great flight with Alejandro. 13. Ski every named run at Taos. No credit. This is extremely difficult! Still missing about 10 from the ticklist. 14. Mountaineer in the southern hemisphere. Half credit for the journey up Cerro Martin near Las Leñas. Not extreme enough for full credit. 15. Watch a U.S. soccer game at the world cup in Brazil. Full credit for the U.S. v Portugal game. 16. Eat curry in India without getting sick. Full credit for a week of spices in Bangalore. 17. Gamble in Vegas. Half credit for using a slot machine in the airport. Certainly not the full experience. 18. Heli-ski in South America. No heli but half credit for skiing Las Leñas. 19. Raft the Taos Box. Full credit. Chilly run with Jeff and Mike. 20. Attend an epic music festival (Tomorrowland?). No credit. 21. Ski Vallee Blanche from Aiguille du Midi in Chamonix. No credit – pushed to 2015. 22. Brew a tasty ale while drinking a tasty beer. Full credit. Thanks Kenny and Jack. 23. Canyoneer in Utah with a 100+ ft rappel. Full credit for a great Moab trip with Leigh, Justin, Mike, Tom, Mark, Sam, and Leana. 24. Create a video of time lapse photography. No credit. How did this not happen? 25. Party with a shot luge. Full credit. 26. Climb a multi-pitch ice or mixed route. No credit. Only top rope work in the ice park. 27. Get a ski race suit and take home NASTAR gold. Half credit. Borrowed a race suit but after 3 days in the race course I was still 0.13 seconds away from the gold. 0.13 seconds! 28. Chase animals around the African savanna. No credit. 29. Backpack in the Canadian Rockies, e.g., Banff. No credit. 30. Get a couple more house plants. Full cred.